While transitioning into Spring, I'm focusing on purchasing light layers and classic staples. A pair of denim boyfriend jeans are such a closet necessity for Spring + Summer. Perfect to throw on with a tee, dress up with a blouse, or over a swim suit! 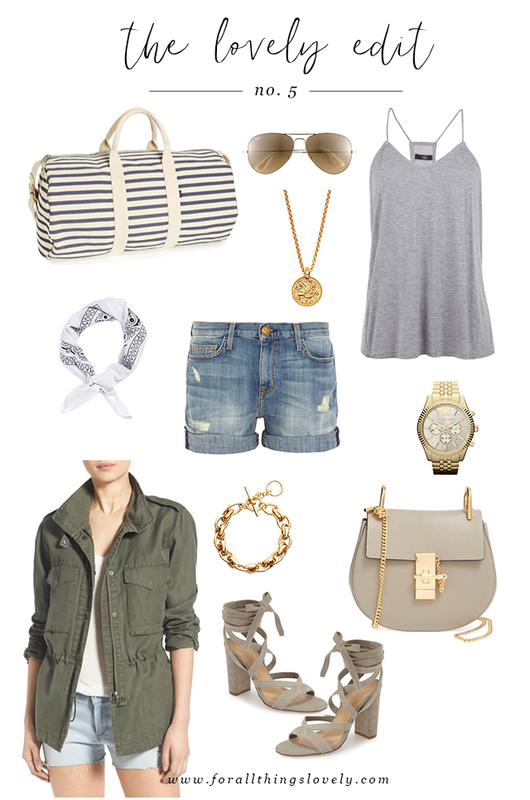 And, how chic is this army green field jacket?! I love the large pockets + the synched in waist and it's a steal for only $68! Add a few grey accessories and finish the look with gold jewels and you have a super chic outfit, full of closet staples! These pieces are beautiful, I love the neutrals and especially greys. The denim shorts and strappy heels are my favourite! Great picks! Making me crave summer so bad! Loving these picks, especially the heels! Gorgeous roundup! I love those heels! Love that grey tank! You can style it so many different ways.